Such is her existence, until she meets Tark. Evil writhes beneath the moody teen’s skin, trapped by a series of intricate tattoos. While his neighbors fear him, Okiku knows the boy is not a monster. Tark needs to be freed from the malevolence that clings to him. There’s just one problem: if the demon dies, so does its host. I have been reading quite a lot of young adult books lately, and for the most part really enjoying them much more then I ever thought I would. 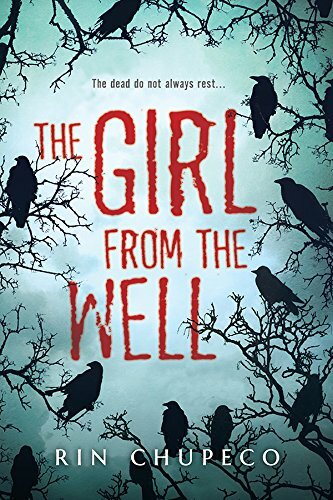 When I found this book on Net Galley months ago, I was a bit hesitant whether to request it or not, because I wasn’t sure what a YA horror novel would entail. What I got was a really very different read, and also a book that I thought was more of an older YA read due to the pretty horrific subject matter. Tark is a fifteen year old boy who literally has fought the demons inside him for most of his life. The tattoo’s on his body were put there by his Japanese mother and are there to hold in an evil spirit that is full of demons of all sorts. There’s an interesting back story to explain his mother’s motivations but I will leave that to the reader to discover. A different spirit, Okiku, is very old and was killed violently when she was young. Since her murder, she hunts down child murderers and kills them-violently. When she sees a child murderer become interested in Tark, she knows she has to protect him and also keep him safe from the malevolent spirit that is trying to get out of his body. Rounding out the main characters is Callie, Tark’s eighteen year old cousin, and only friend. She is one of the few adults that can see both of the spirits attached to Tark. I thought the premise was really different and worked as a horror concept. Spirits, demons, and child molester/killers were all part of this concept. I also thought the use of the spirit, Okiku’s point of view for most of the book was really unique. I don’t think I have ever read a book that is told from a spirit’s point of view-especially a spirit that is a child killer hunter. I enjoyed Tark as a character. He may have been harnessed to a horrible spirit most of his life, but he was smart,with an underlying sadness, and still had a personality that was full of snark. Callie was sweet and so protective of Tark, that the reader can’t help but like her. However,(and I can’t believe I am saying this) I found my favorite character was Okiku. Even with her horrific background, and her three hundred years of vengeance against monsters, she grows on the reader due to her protectiveness towards Tark and Callie. Through these two, Okiku finally becomes interested in something other then killing monsters. A big part of the book takes place in Japan. During this part of the book, there’s an incredible amount of time spent describing exorcism in detail. It was at this part of the book that I kind of got a bit lost at times. Lots of Japanese words, customs, and Japanese names contributed to this for me. It got pretty complicated at times, at least I thought so. However this part of the book, was also rich in Japanese folklore and was very interestingly incorporated into the story by the author. Ages 16 plus would be my thought. I found this book to be extremely well written with a story line that could be scary for some young people. I did enjoy it, but need to say, when I finished it, I sat and thought about it for a long time before starting to write this. It’s not an easy book to read due to quite a few deaths-most of which were pretty horrifically incurred. The middle of the book in particular, kept me turning pages non-stop, so it was a pretty fast read, and also a read that will probably stay with the reader long past finishing this book.